Elaine Hunter, exhibiting artist, 2018. 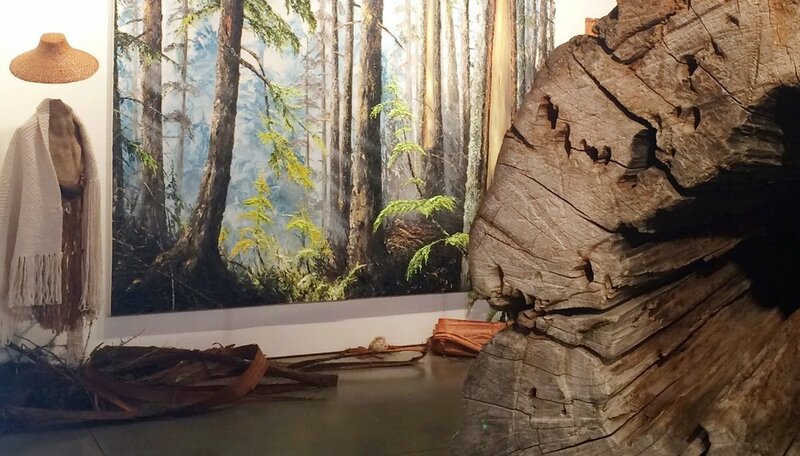 The 2015 curated art exhibition featured ‘multi-disciplinary’ visual and sensory perceptions of how a group of coast-based artists interpret the subject of CEDAR. Influenced by different cultural backgrounds and the senses of sight, sound, touch, taste, smell, and spirit, visual artists, sculptors, fibre-artists, writers and musicians will come together to collaborate in an “art as process” journey of self and collective discovery. The 2014 MIND OVER MATTER" Art Exhibition was both a ground breaking and record breaking community event. The 2014 “Mind over Matter” ten day ART exhibition explored six unique cross-cultural collaborations between fourteen coast aboriginal and non-aboriginal artists. The show illustrated a variety of “stories,” some personal, some profound and others provocative, while combining traditional and contemporary art and media. Painters collaborated with glass artists, poets, weavers, photographers or wood carvers to tell their stories visually and in words. This special exhibition focused on all new works presented in a dynamic installation-type format. A collaboration greater than the sum of its parts, this unprecedented exhibition, possibly the first of its kind in Canada, delivered a learned experience for the artists, as well as an engaging and educating event for visitors. Simon Brault: No Culture, No Future.